Redshed.co.uk/blog/how-do-credit-card-numbers-work will decipher the meaning of that long string of numbers on your credit card. 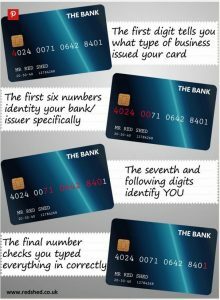 The first number, for instance, is the type of institution that issued the card, such as a bank. This is a garden supplies shopping site in England but has interesting information.